he Lodge at Mag Bay is perhaps the finest home in all of Magdalena Bay from Adolfo Lopez Mateos to San Carlos for fishing, whale watching or vacationing in general. The Home itself has room for 7 people to sleep, including 3 bedrooms. The property also has a beautiful pool and garage for parking. There is a pool and hot tub onsite – which also is the only one in all of Magdalena Bay. e offer an experience of a lifetime. Our focus is sport fishing, but we also offer whale watching, free diving, kayaking and kayak fishing. Our trips are all inclusive so you get to enjoy the vacation rather than worry about where to find the next meal, etc. For those of you who prefer to find places to eat out, or cook on your own this is also easy to do, just contact us for custom needs of any sort. his home was built in the early 2000’2 and was held private until sadly the founder passed in 2016. 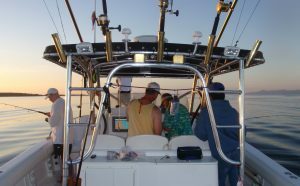 Those of us lucky enough to know the founder of the Sport Fishing Facility have enjoyed some of the best fishing the world has to offer over the past several years. As all things happen, the founders family decided to take on a couple partners and let the rest of the world know what a truly amazing experience is to be found in the gem of San Carlos, BCS Mexico. Our captains know the bay and the surrounding ridges like most Americans know their own smart phones today. It is en grained in their every day lives and it becomes immediately apparent when you see how well we know the fishery and the waters. If you read up on the area, you will find that people can spends months fishing here, and still barely touch the surface of the amazing and unspoiled fishery we have. hat you find when you vacation to this home is something that is a challenge to explain. We are off the beaten path even for Baja, and the culture is something amazing. The fishing grounds off our coast might perhaps be some of the finest in the world for quantities of pelagic fish, but the experience of the culture, the boats, the mangroves and the baja lifestyle is something truly wonderful.